Get Witch Quick is the first book in the Wicked Society series of lighthearted paranormal romances with a cozy mystery twist. 5.0 out of 5 starsHighly enjoyable! Bring on the next in the series! I love Daisy Prescott and when I found out that she was delving into a new paranormal series, I couldn’t wait to read it! Madison and Andrew are a new couple heading to Boston to intern with the Wicked Society. I love the new world and all the witchcraft elements. Having visited Salem and Boston a few years ago, the descriptions take me back to the beauty and witchy area. I don’t want to spoil the story for anyone, but will say that I highly enjoyed this book and am eagerly awaiting the next in the series! 5.0 out of 5 starsEnchanting and witty: this first in the trilogy simply made me smile! working at an internship of sorts during the summer for the Wicked Society. Tate and Sam make up the rest of their tight foursome and as usual there are some unusual occurrences and a bit of mystery to be solved. At the core is Madison's POV and the blue aura only she can see. Getting help from some friendly ghosts and the decision to protect the sacred book everyone seems to be after makes for some interesting and hair-raising times. I love that the Author has such a fondness for the supernatural and all things witchy. Her enthusiasm definitely comes through as does her signature dry wit, making this a wonderful short read that will undoubtedly make you smile. This is a great companion to the original series and I do think reading that first will only add to your experience with this new trilogy. 5.0 out of 5 starsA cozy, wonderful read! I was so excited to get this novella! In preparation of reading it, I turned my home thermostat to what my husband terms as 'meat-locker' temperature, I lit all my pumpkin spice candles and curled up under my fuzzy blanket. My husband cam into my reading nook and looked at me like I was crazy. "Why is it freezing in her and smells like fall?" he asked. I looked up smiling, "Duh, because I'm reading a book about Witches and its going to be wonderful!" Oh boy was I right!! It was wonderful! 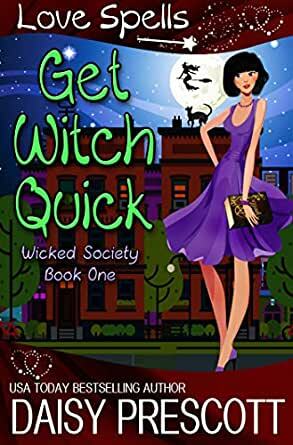 Get Witch Quick had everything I had hoped for and more! There was mystery, danger, snarky fun and swoony romance. I love Daisy Prescott's writing and this novella put me in the mood for fall and all things witchy. I can not wait for more in the series!! Note: I would definitely read her Bewitched series. This is a 5 broomsticks kind of read. I love they mystery and intrigue of this story. I love that Madison is coming into her own. I love that Andrew is by her side helping her and encouraging her. Ohhhh I especially love the supernatural element of this story. I am obsessed with ALL things witchy. I first fell in love with Andrew and Madison when they were introduced to us in the Bewitched series. Fast forward the gang has graduated college and have been asked to go to Boston not only for training but to help the secret society crack the code and history of the lost black book, that was shown to Madison by ghost in the Winthorp mansion. There is lots of twist and turns in this story along with help from the paranormal to find out who is behind the attack on the coven. I can't wait to read what comes next.